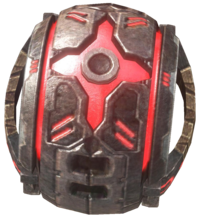 The radar jammer is an equipment item in Halo 3 that scrambles nearby players' motion trackers by creating a multitude of false dots on the radar of everyone within range. While it can create chaos for enemies, it also has the same effect on teammates. In campaign mode, it is uncommon for one to be dropped by Brutes, but is often used by Brute Stalkers to make them even harder to be found. It is no longer available in matchmaking as it, along with the flare, had physics properties that allowed players to exploit the game unfairly. The radar jammer is similar in appearance to the power drain and flare, except for a red glow instead of blue or yellow one. Its symbol in the heads-up display is a dot with curved waves emitting from it. While under the effect of the radar jammer, it is possible to distinguish between the 'false enemies' and the real enemies that are displayed on your radar. The dots on the radar generated by the jammer almost never stop moving, whereas real enemies tend to move more carefully and stop at points. The fake blips also seem to move faster and more "fluidly" than a real player. An activated radar jammer can be destroyed by weapons fire. The radar jammer lasts only 30 seconds before it self-destructs. When the player deploys a radar jammer in campaign mode, Brutes will sometimes become confused and look around distractedly. This clearly suggests that Brutes have some form of radar system similar to that of an Elite and Spartan-II. If the player is seen by a Brute or a Grunt when deploying the radar jammer, the Brutes may occasionally go berserk; Grunts will sometimes panic and run away. Red radar "blips" generated by the radar jammer will move much faster on your motion tracker screen than those generated by an actual enemy. Radar jammers are pointless when playing with the Fog Skull or without radar in multiplayer. The radar jammer has been removed from all matchmaking playlists due to the double jump that could be accomplished with it. At first, the radar jammer appears to have an "effect radius", i.e. anyone within the radius is instantly affected by its attribute (similar to the regenerator, power drain, and flare). This is not completely true, as instead of an instant effect upon those within range, the jammer creates "ghosts" which fly around randomly, altering only the motion-trackers of those players within range. The effect moves with the jammer, as witnessed by the position of the red blips relative to the jammer. This is most noticeable on either Valhalla or Narrows, where by throwing the radar jammer into one of the man cannons, the red blips appear to fly in the same direction it was launched. The blips created by the jammer move in a fast, erratic way, similar to drones. The radar jammer can be helpful in performing the Radar Jumping Glitch, which makes you appear to be double jumping. It is more effective than the infamous grenade jump. Nathan Fillion, a voice actor in Halo 3 and Halo 3: ODST, is known to insist via Xbox Live that he invented the radar jammer when people inquire about his Bungie Armor. The active camouflage Armor Ability from Halo: Reach provides a similar function to the radar jammer when activated; however, its effects only scramble the motion trackers of the player and nearby enemies, not nearby allies. The radar jammer when activated in Halo 3. A view through a sniper rifle's scope reveals that Jiralhanae Jumpers also carry radar jammers. The radar jammer HUD icon. A radar jammer extends its sides and glows brightly when activated.